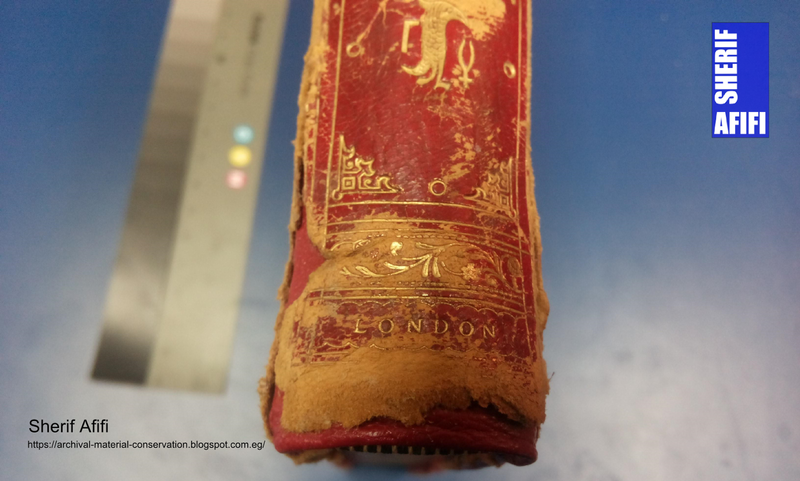 Missing Endband in a Rigid Spine! 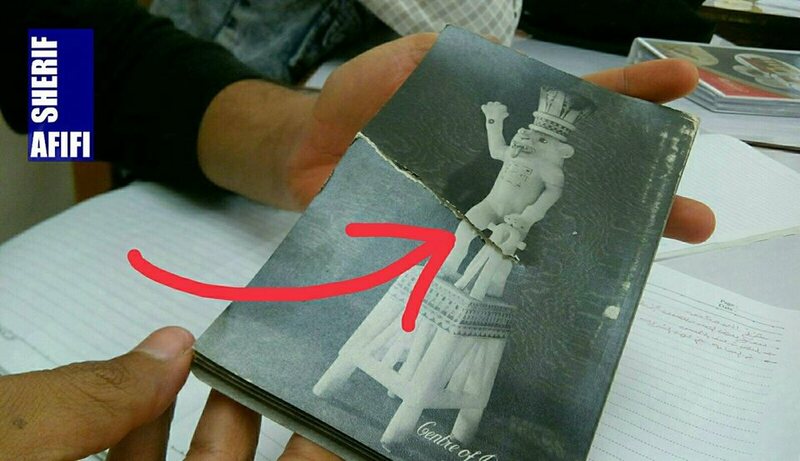 is it possible to restore? 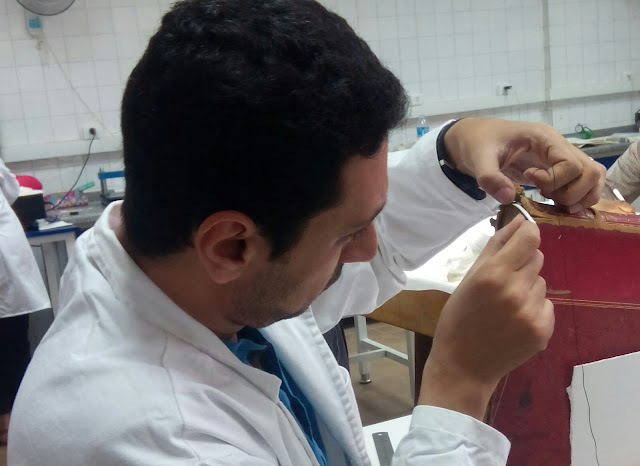 Last year I had the opportunity to try out and tutoring some new treatments and conservation techniques, during my Master program. 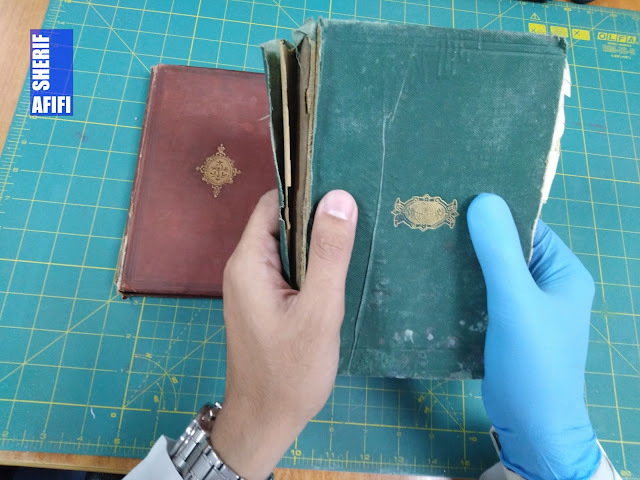 A lot of challenges that my colleagues and I have faced during this course, despite my long period experience as a book conservator, but conservators always learn, and challenges are always welcome to teach us. 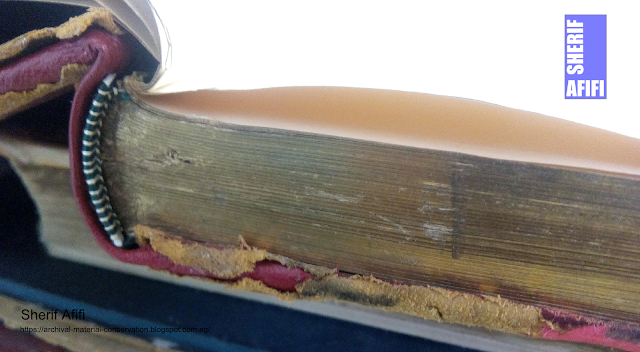 Easily conservators and restorers can (clone) or imitating historical headbands styles, this is for sure easy for headbands (endband) professionals and lovers, but, have you ever thought about a book with completely rigid true raised bands spine? Which has one (or both) of its headbands were missing? 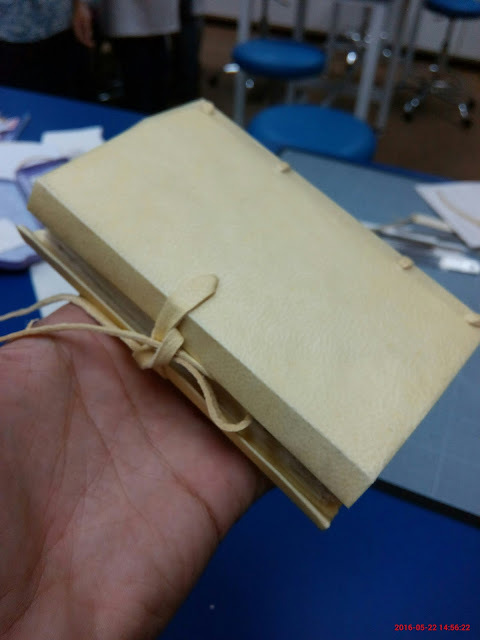 What if you would like to clone an endband instead of the missing original one without disbanding the rigid spine leather especially if the spine in a fair condition? 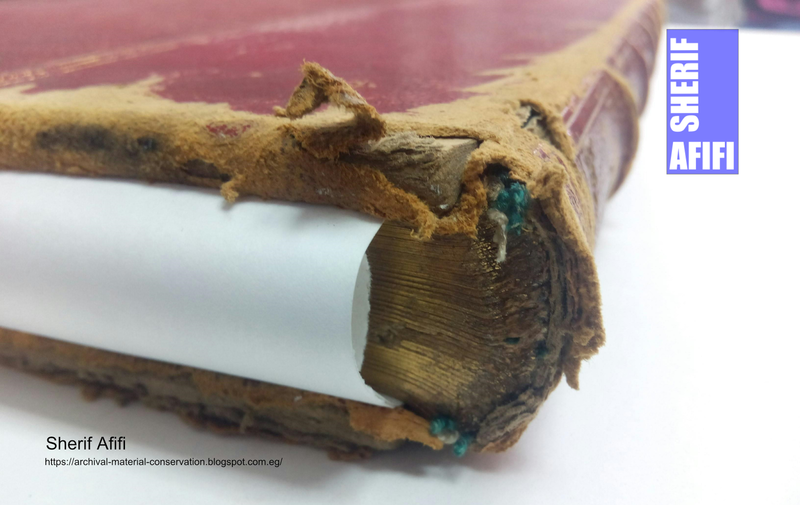 It is an essential manner to keep, conserve and preserve all the historical evidence that the object carries, therefore, saving the original spine and its identity is not an optional choice for conservators, it is mandatory. 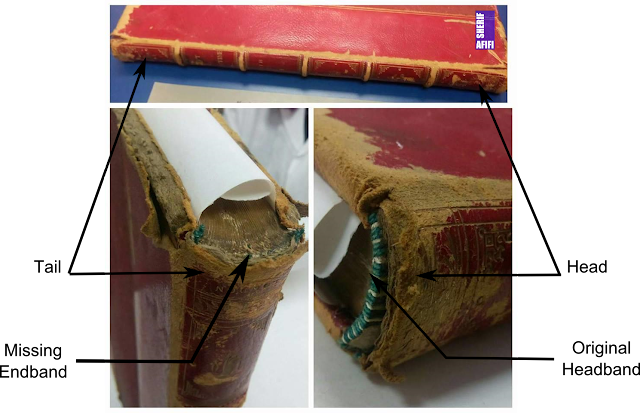 The same condition as questioned above, a 19th-century rare book titled "Egypt and Palestine Photographed and Described by Francis Frith" in a condition of deteriorated cover and missing one of its headbands (specifically the endband) due to wrong handling and its movements from and to the shelves, the spine was rigid along with true raised band (Fig 1), has been requested to be conserve and restore. Mechanically using a spatula and gently the lining paper layer which carries the leatherback has been separated from the spine, for about 4 to 5 cm towards and just before the last raised band (Fig - 2). 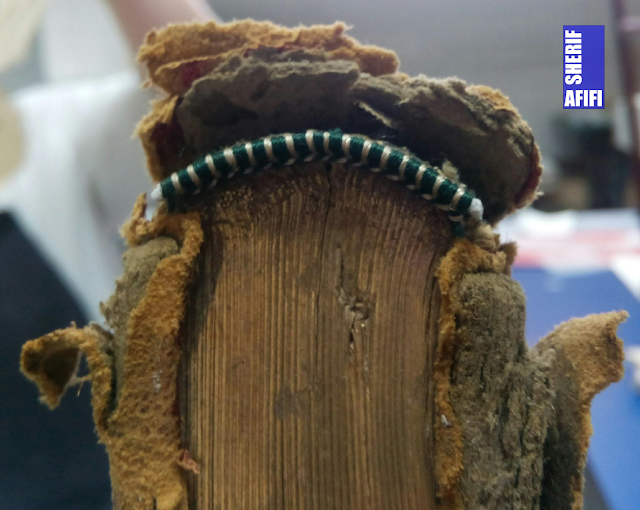 The dry mechanical separating method for the spine was not easy at all and required time with a lot of patience, otherwise, more deterioration will take place. Avoiding any folding to the leather during and after separating was required to avoid any other cracked to the leather especially it was acidic. Headband Core: Acid-free carton has been used as an endband core, with the same thickness as the original headband. Threads: I have chosen silk green and beige color (from Gutermann & from Faro) for the endband to match the same colors on the original one (Fig - 3). 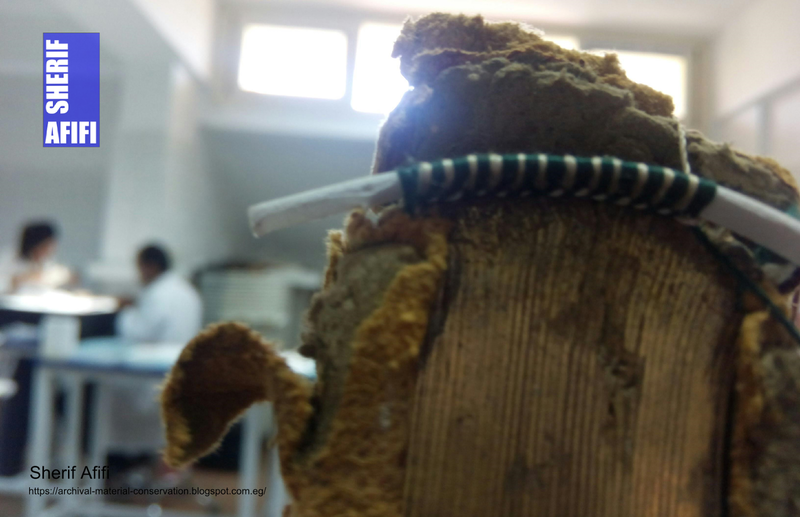 The hardest part was starting, tying-down, and ending the threads during making this headband using a curved needle, without strongly lifting the spine leather back which has been separated earlier. 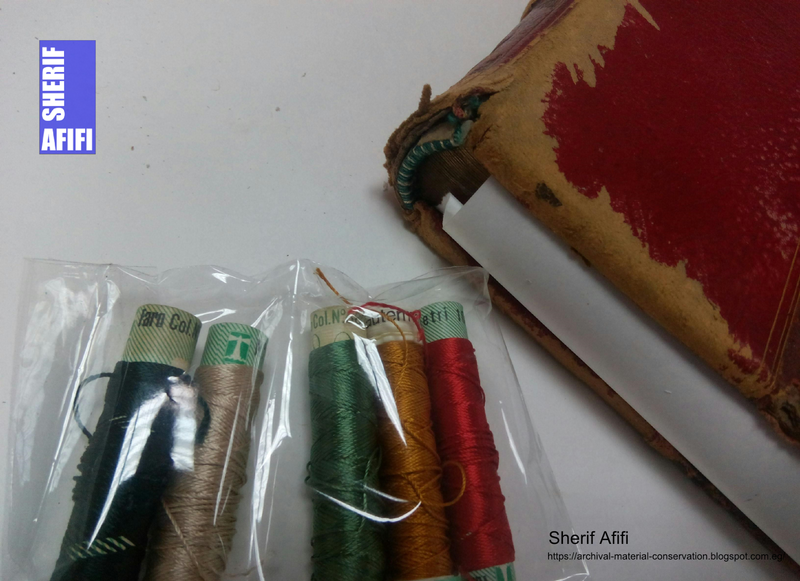 Maybe I will write another blog about some different methods and techniques that I have experienced in headband conservation and restoration, and you should understand that you can not use only one method for each conservation or restoration problem that you face. reading this previous blog, and you will find a video about a new method for restoring headband. 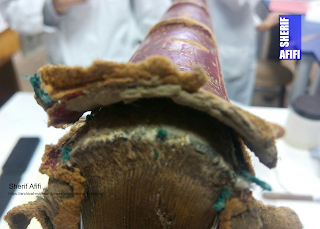 As a conservator, you have to study carefully and closely the object before making any decisions with accordance to the conservation and restoration international code of ethics, and even you have to think about the durability of the object with accordance to its size and weight and its relation to the binding mechanism, especially if it will be placed back to the shelf to be available for researchers.